The former Hallo Berlin space at 626 10th Ave., between West 44th and 45th streets. HELL'S KITCHEN — An upscale French-Creole restaurant being touted as the first of its kind in Manhattan is coming to 10th Avenue later this year. Le Privé will open its doors at 626 10th Ave., between West 44th and 45th streets, this fall, owner and operator Sanjay Laforest told DNAinfo New York. Laforest, who runs a marketing and consulting company called Privé Group, said he researched French and Creole-influenced restaurants in New York City and in France and discovered there was “no [French-Creole] concept” like the one he plans to open on 10th Avenue. “Le Privé honors the savory blends of Creole cuisine; it articulates its French colonial backdrop through reimagined dishes,” read a draft of a write-up he plans to circulate about his eatery. A tentative menu filed with Community Board 4 includes dishes like a conch stew with artichokes, sundried wild mushrooms and saffron basmati called Lambi à la Créole; slow-roasted pork shoulder with fava bean risotto and Bordelaise sauce called Conchon Rôti; and squid ink linguine with sauteed shrimp, mussels, clams, spicy salami calabrese and red chilies. Laforest flew in a chef from France to devise the menu, which is still in the works, he noted. 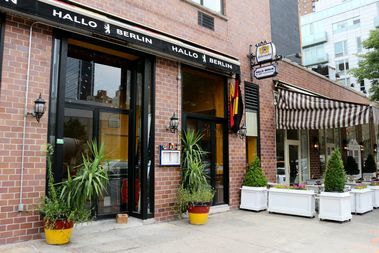 The space was formerly home to the German restaurant Hallo Berlin, which announced in June that it had permanently closed. Its owners didn’t respond to requests for comment. Le Privé is expected to open in November, Laforest said.